Trev's favorite thing is launching from the trampoline into the pool... and he just isn't going to be able to do it this year. Without breaking a leg, anyway. So! Maddie is now officially big enough, and we can upgrade. Oh. You should see my backyard. There is a reason everything is shot in macro. We are the Sanford & Son of backyards, friends. A 14 foot trampoline. Firepit. Playhouse. Two patios (one covered, one not). Small pond with meditation spot. Veggie/cottage garden. Swingset. Numerous small (tiny, maybe) gardens and beds. Huge compost pile. One tiny sandbox. Five fruit trees. This dirt by the slide is where the pool was last year. And now let's add a fifteen foot around, 42 inch high pool, shall we? Sandford and Son, I tell you. Well I confess, our "grounds" around our very humble abode resemble something of a lawn sale at times too. What with the various piles of wood, lumber, and projects the boy has going. You only go this way once - might as well pack in all the fun you can into the backyard!!! I think your space is charming. lol - but they (S&S) never had to go anywhere else to find something interesting did they? :) 's to both of you! Thanks. I feel so much better. Wow room for a pool and a meditation spot I'm envious. Jumping from trampoline to pool is something I could do all day too! Drew and I are ALWAYS saying our yard looks like Sanford and Son! I admire everything you do in your little space. You are the one who makes me think "I could live in a city if I absolutely had to." You bring a lot of life into your home and yard. Oh, my...my backyard looks just like yours. I think it is the way backyards should look when you have little ones. They need lots of interesting places to go and things to do. We have to replace our trampoline this year, so ours isn't there yet, but one will be very soon. I think they want to set it up so they can use the zipline to launch onto the trampoline. I see now why you don't have a safety net up. Your comments all made me laugh. Phyllis - we play lots of launching games onto the trampoline, and of course jump off and into the pool, too. Can't have a net. They don't really appeal to me, anyway. Brianna - funny about not looking right or left! Oh I just love your garden!!! Totally!!! "I wonder what my neighbours think?" Having read your post, and the comments here, I realise we are not alone and I feel so much better. We'll all swap pictures to print out to our neighbors. We'll say "Cheer up! You could live next to these people!!" Add us to the list of Sanford and Sonner's. (My husband is humming the theme song now...as I type this.) It's great though. I love our space (wish it was a tad bigger) but we make due. And really, who wants a perfect yard that looks as though it's never used. No fun in that. And interestingly enough - we've always called our neighbours Sanford and Son because they actually have a garage full of junk. (And we don't know their realy names.) Too funny! 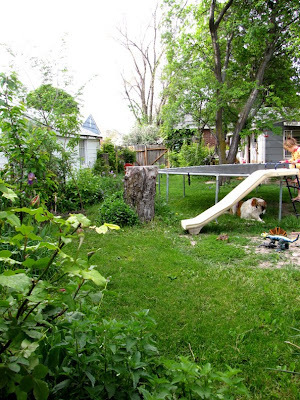 That is what kids' backyards are supposed to look like! Think of all the memories created back there! I would like to hear more about the meditation garden. Oh I think your backyard is perfect. Adventure, serenity, homegrown goodness... Doesn't get much better! Theresa - I'll do that very soon! Our yard is a big jungle filled with sand. Thanks to living in Florida! Carrot Oak *things* all over the floor, snakes, lizards, bees, wasps, staghorn fern, grapefruit tree(which desperately needs trimming), bushes that we have tried to tame back. We need like 3 weeks back there and about $1000. Neither which we will get.